Below is the content of the Draft as live text for your review. . . The Pozo / La Panza place is identified in the 2005 Los Padres Land Management Plan (LMP), as a vast rolling chaparral landscape including a motorized recreation network supporting dispersed recreation activities, grazing areas for wild horses and livestock, and private in holdings in a remote part San Luis Obispo County. Program Emphasis described for the area in the LMP includes OHV use and dispersed recreational opportunity while resolving conflicts with other important resources. The Pozo / La Panza Off-Highway Vehicle (OHV) Area multi-use trail system includes routes designated for motorcycles, All Terrain Vehicles (ATVs), and 4X4s as well as mountain bike, hiking and horse trails. The views of the coastline and the Sierra Mountains on clear days from the higher peaks such as Pozo Summit (elevation 2635 ft) and Black Mountain (elevation 3622 ft.) draw locals and visitor from as far as the San Joaquin Valley and the San Francisco Bay Area. The present trail system developed over time from casual use of the trail system that existed when the National Forest was established at the turn of the century. The system expanded over time though public use of fire lines, fuel breaks, mining and power line roads, and other paths. The system was not designed to accommodate the level and type of recreation uses which began to emerge in the 1950’s, particularly off-highway vehicles. In 1962 a study evaluated what restrictions were needed on off-highway vehicle use in Los Padres. After meeting with interest groups and individuals the Forest recommended, in 1964, that no use restrictions be placed on National Forest Lands within San Luis Obispo County. Eight years later, in response to an increase in off-highway use nationwide, President Nixon signed executive order 11644 establishing policies and procedures to ensure controlled use and protection of natural resources. In 1973 the Regional Forester, in response to the President’s direction, declared a moratorium on cross-country off-highway vehicle use throughout California pending completion of individual National Forest off –highway vehicle plans. The Santa Lucia Ranger District (SLRD) Off-Highway Vehicle Plan was completed in 1974 by District Ranger W.R. Griffin. This SLRD OHV Plan was developed with extensive input from the Central Coast Trail Riders Association . The SLRD plan was incorporated into the 1976 Forest-wide Off-Highway Vehicle Management Plan. The 1976 Plan was accompanied by an environmental analysis that evaluated past off-highway vehicle management and discussed effects on forest resources. The plan designated specific areas, roads, and trails available for use by motorized vehicles. The A National Forest Trail System Plan Draft was developed in 1993 but was never published. This comprehensive document identified many of the resources issues, conflict of uses, and the lack of connectivity of the trail system that still exist today. Although much of the original 1976 route system remains today there have been periodic changes to the system, including closure and decommissioning of routes with unacceptable impacts, rerouting of problem sections, and limited “designed for” new construction of motorized trails. An additional review of the SLRD trail system was conducted by the Forest Service during implementation of the Travel Management Rule in 2007. A complete inventory of all off-highway routes on California’s National Forests was recorded between 2006 and 2008 using GPS methodology. Funded by the California Off-Highway Motor Vehicle Recreation Division, the route inventory included all non-system routes such as user created off-highway vehicle trails. These routes were subsequently analyzed for possible addition to the national Forest Transportation System. Routes with unacceptable impacts to resources were closed to public use. A Motor Vehicle Use Map was published that shows roads, areas, and trails that are open to public motor vehicle use by vehicle class and season of use. Because the SLRD had a designated system of National Forest roads and trails no changes were made to the SLRD transportation system during implementation of Travel Management. The SLRD transportation system also provides essential access to a wide variety of non-motorized recreation including wilderness trails heads (Machesna Wilderness, Santa Lucia Wilderness), hiking trails (Wilson Canyon), mountain biking (Fernandez trail and other forest roads and trails). The transportation system provides access for hunters who use quads for game retrieval and Forest visitors who come for popular activities such as wildlife viewing, camping, picnicking, and driving for pleasure. The Rock Front, La Brea, and Figueroa Mountain areas of the Santa Lucia Ranger District also provide an important system of Forest roads and trails designated for OHV use. These areas are managed with the assistance of volunteer groups from Santa Maria and Northern Santa Barbara County. Because these areas are geographically separate from the Pozo La Panza area they are not specifically addressed by this plan, however they are no less important and many of the same findings and principles of management apply to these areas. With time, these areas should be included as part of a comprehensive Santa Lucia Ranger District OHV Plan. The purpose of this plan is to establish the baseline and goals for managing the Pozo / La Panza OHV area. Continued availability of the area for public use is dependent on the presence of organized volunteers working together with the Forest Service and fellow users. Effective management that includes Resource protection will ensure the area remains available for future generations. This plan will identify those areas needing improvement and the groups that have the ability to make those changes. This plan will develop management strategies to protect resources, involve partners, and invest in recreational opportunities. The Pozo / La Panza area is located on the north side of the Santa Lucia Ranger District. This 18,867-acre area has approximately 43 miles of routes. It extends from the Machesna Mountain Wilderness area on the southern end to the Black Mountain Wild Horse Territory to the north. Included in this plan are the Garcia OHV Trail, Hi Mountain Lookout Road, Turkey Flat Staging Area, La Panza and Friis Campgrounds, and the Navajo Flat Staging Area / Campground that is currently undergoing improvement. .
We estimate that the Navajo Flats staging area receives, at a minimum, 5000 and 7500 visits per year. This is based on traffic counter data collected by the Forest Service. Trail traffic counter data recorded during 2009 revealed that Burnout trail, which originates from the Navajo Flats Staging area, received approximately 10,000 trips. Red Hill Road, which provides access to the Navajo Flats staging area, received over 14,000 trips. 14% of “walk in” inquiries at the Forest Service office in Santa Maria were OHV related . National Forest Visitor Use (NVUM) data was collected for Los Padres National Forest in 2009. Results are attached and can be verified by using the interactive web site found here: http://apps.fs.usda.gov/nrm/nvum/results/A05007.aspx/Round2. The Survey reports approximately 50 vehicles per day at the Turkey Flats staging area on the two days surveyed. Turkey Flats is a second staging area for the Pozo La Panza OHV area. NVUM survey data is not available for Navajo Flats. To provide a place for recreation to co-exist with responsible land management by maintaining an OHV trail system that allows riders to enjoy their experience and challenge themselves while promoting “Tread Lightly” ethics and protecting sensitive resources. Improve cooperation between the Forest Service and the users to cultivate alliances for management of the area. Improve OHV trails and facilities while emphasizing safety and resource protection. Many routes on the present system were established through years of mining, range use, utility access and fire line construction that evolved into an OHV trail system. Ridge and fall-line trails follow dozer lines from past fire line construction. Erosion on some trails left scars several feet deep on hillsides requiring re-routing or placing bricks to harden the surface. A mix of single track trails, roads, and 4X4 routes make it difficult for riders to safely and legally connect to certain trails. The Pozo / La Panza OHV area is a natural appearing landscape that functions as an open space and motorized recreation area that requires advanced skill levels. Healthy watersheds are maintained by managing the OHV system. The route system provides access to non-motorized recreational uses such as hunting, mountain biking, camping, hiking, horseback riding, nature viewing, recreational mining, target shooting, and the running of hounds. Effective management of the route system minimizes impacts to natural and cultural resources and resolves conflicts. The management strategy reflected in this plan desires a well maintained system that combines motorized recreation with non-motorized recreation and preserves and protects resources. As to the motorized recreation, it is desired to improve trail connectivity, trial looping characteristics and sustainable trail designs. Trail maintenance of the off-highway vehicle trails system in the Pozo/ La Panza area is presently accomplished through a cooperative agreement between the Forest Service and the Central Coast Motorcycle Association (CCMA). The CCMA has a large work force of volunteers who commit significant resources toward maintenance of the trail system. 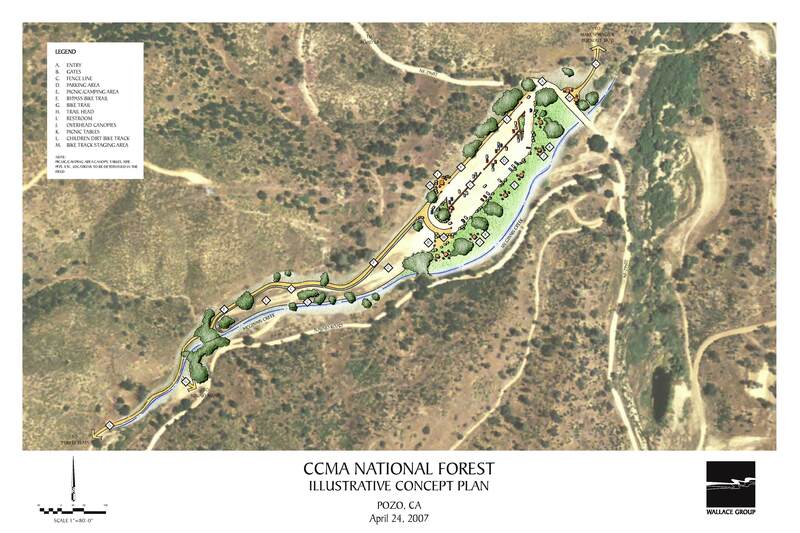 CCMA has recently received state and local grants and has utilized these funds to accomplish many projects on the Los Padres National Forest. All trail maintenance tasks will follow standards listed on Trail Management Objectives (TMOs) for each trail. The levels of maintenance are included in Appendix X. Restoration is a critical activity that protects sensitive resources such as riparian areas, cultural areas, sensitive habitats, and watersheds. Restoration will be accomplished on trail sections that have been re-routed and where trespass has occurred on and off the trail system. Restoration of OHV areas can be difficult because of the remote locations and continued use of closed routes. The keys to effective restoration efforts include: 1. Making the route invisible; 2. Effectively barricade the site; 3. Make it obvious that restoration is taking place; 4. Make the site impossible or highly undesirable to ride. The Red Hill Pipe Fence restoration project was completed in 2012 to protect cultural sites and the Camatta Canyon Amole. Continued monitoring is necessary to ensure that sensitive resources are being protected and barriers are working as effective tools in the restoration process. The Friis Meadow restoration project is in its final year of completion. Vehicle traffic around the camping area has reduced vegetation adjacent to the creek. A horse step and gate have been installed to restrict motorized access to the Black Mountain Roadless Area, where unauthorized use still occasionally occurs on the the decommissioned Black Widow Mine trail. An open area north of Turkey Flat Staging Area, also referred to as “Turkey Flat II,” will need action taken to prevent resource damage from continuing in the area. This has long been a popular staging and dispersed camping area that has recently experienced increased use. This location is a place where a designated system trail crosses the paved road. Installing fencing and other measures to control traffic and designate camping and parking areas will reduce continued damage and help protect the riparian area. Signs on OHV trails follow the engineering guidelines in EM-7100-15—Standards for Forest Service Signs and Posters. Trail and road signs provide a clear and concise guide for users to navigate to trails that accommodate their level of skill. Common trail names and difficulty levels are used to allow for easy navigation. Mixed used sections on roads identify areas that are open for vehicles and OHVs which state, “Share the Road.” Signs also indicate which roads are limited to highway licensed vehicles only. Temporary signs for closures identify the areas closed for access and explain the reason for the closure. Closure signs should be removed as soon as possible when conditions allow. If any closures are in effect, the forest website will provide additional information for the public to view. A sign inventory is included in Appendix X. With a declining federal budget recreational activities on National Forests have become increasingly difficult to provide. Vacant Forest Service staff positions can be difficult to fill and funding for supplies is becoming scarce. Volunteers are a key component of any plan to maintain and improve areas on the Forest. Strong partnerships need to be built with user groups to ensure the future of the Forest Developed Recreation programs and OHV trail systems. The Los Padres National Forest has multiple volunteer agreements with individuals and groups that assist with maintaining areas that may not receive as much attention as needed. Volunteer groups that presently have volunteer agreements with the District include the CCMA, the Santa Maria Four Wheelers, the SLO Four Wheelers and the Cal Poly Penguins Motorcycle Club. The Forest has applied for and received funds to promote safe and smart riding and ethical responsibilities of OHV users. This included offering “Orientation Rides” which were part of permitted special use recreation events where booths of educational information was handed out to kids and adults. Community events, such as fairs, parades, and schools events were attended by Forest Service staff and volunteers. Funding was used to update and print the Motorized Vehicle Opportunity Guide (MVOG), which includes all the OHV trails that are designated to ride, as well as other recreation features in the area. Interpretive signs have also been purchased for Navajo Flat and Turkey Flat Staging Areas which will include information about the ecosystem, Tread Lightly and Leave No Trace ethics, as well as an OHV trail map of the area. The “One Less Spark, One Less Wildfire” campaign seeks to educate forest visitors on hazards like parking in deep grass, dragging chains, and the use of spark arrestors to reduce the number of forest fires. Forest Service staff and volunteers continue to make public contact on the forest to educate as many users as possible of proper riding and their role in keeping this area open to everyone to use. Trail and road closures occur annually during the rainy season. When ground is wet the soil is soft and impressionable. Ruts are easily developed by tire tracks and repeated vehicle use deepens the ruts. . As the soil dries and hardens, the ruts remain and become channels for future rain water runoff, creating erosion. Another major consideration for seasonal closure is public safety. Closures are implemented when conditions on Forest roads and trails become hazardous to the public and staff. A Wet Weather Plan identifies who is responsible for closing areas and the conditions that require closure. Volunteers are used whenever possible to assist with closures, especially during the holiday season when staffing is limited. Volunteers also assist with soil sampling to determine the amount of precipitation that may adversely affect soil trafficability and make the tread surface susceptible to damage. Volunteer participation in wet weather closures allows trail users to see the conditions that warrant closures and the damage caused by improper motorized use. The Wet Weather Plan is included in Appendix X.
Motorized mixed use is defined as designation of a NFS road for use by both highway-legal and non-highway-legal motor vehicles. Mixed use may be allowed following analysis by a qualified Forest engineer and documentation of engineering judgment. The Pacific Southwest Region of the USFS has issued several communications regarding motorized mixed use. In January, 2005, the Regional Forester requested an opinion from the California Highway Patrol (CHP) as to whether ML 3 roads were considered “Highways” under Section 38001 of the California Vehicle Code and if combined-use regulations (CVC 38026) applied. The response to this letter precipitated a joint meeting in August, 2007, and an additional response from the CHP on December 19, 2007 which indicated that ML 3 Forest roads that are gravel, dirt, or unpaved surface roads that have been operating as mixed use roadways fall under the “roughly graded trails and roads upon which vehicular travel by the public is permitted” under CVC section 38001 and are therefore eligible for mixed-use. In addition to an engineering analysis changes in these mixed use designations require CHP consultation and NEPA analysis such as an Environmental Assessment. Changes in maintenance level may be made by an administrative decision. Several Forest roads intersect with OHV trails in the Pozo / La Panza area including Navajo, Fernandez, Black Mountain, Queen Bee, Frasier Canyon, and Red Hill Roads. Navajo Road, a Maintenance Level 3 road allows highway licensed vehicles only to travel between Navajo Bypass and McGinnis Creek trails. Friis Road is a Level 2 road which allows for OHV travel from the Five Points intersection to the Navajo Bypass trailhead. Travel beyond the trailhead to Friis Camp is limited to highway licensed vehicles. Two locations have been proposed for mixed use. The first, Fernandez Road, between Navajo Flat Staging Area and Benchmark OHV Trail, has been reviewed by the California Highway Patrol (CHP) who concurred and allow for mixed use on this section of road. Black Mountain Road is a Level 4 paved surface road that serves as a critical connecting route between Howard’s Bypass trail 15E05 and the trail system. Black Mountain Road, as a Level 4 road, is presently ineligible for use by non-highway licensed vehicles. Past proposals to the Regional Forest Engineer for reclassification of Black Mountain road to allow mixed use have not been approved. This proposal will continue to be brought forward. Trail re-routes surrounding Black Mountain Road were reviewed by Trails Unlimited and it was determined that an alternative route would require trail construction in an area of poor quality soil that could be costly and labor intensive to maintain. Improvement in the existing OHV trail system is needed in regards to connectivity, looping characteristics and sustainable trail design. Because some of the existing trails were not initially designed as OHV trails, these features are sometimes not optimized. Input from specialists in trail design, such as Trails Unlimited, will be sought to identify and implement improvements to the trail system that will address these issues. Improvement are essential to not only enhance the recreational experience for OHV users, but also to enhance safety, minimize conflicts with other uses, preserve resources and sustain balance. Fire prevention in the area is a concern with the hot dry conditions that exist 9 months out of the years. USDA approved spark arrestors are required on all off -highway vehicles used on National Forests year round. During fire season ( add dates) wood and charcoal fires are sometimes prohibited in all areas of Los Padres National Forest including designated Campfire Use sites; however, the use of portable stoves and lanterns using gas, jellied petroleum or pressurized liquid fuel is allowed within designated Campfire Use Sites .You must clear all flammable material for a distance of five feet in all directions from your camp stove, have a shovel available, and ensure that a responsible person attends the stove at all times when it is in use. Fire danger rating is a broad scale assessment that describes conditions that reflect the potential, over a large area, for a fire to ignite, spread and requires suppression action; “adjective ratings” are a public information description of the relative severity of the current fire danger situation in a general area. Adjective ratings are generally posted on signs as visitors enter public lands or at agency offices. Five color coded levels are used to help the public understand fire potential and help mitigate their actions to prevent human caused wildfires. When the fire danger is “low” (Level 1) it means that fuels do not ignite easily from small embers, but a more intense heat source, such as lightning, may start fires in duff or dry rotten wood. Control of fires is generally easy. When the fire danger is “moderate” (Level II) it means that fires can start from most accidental causes, but the number of fire starts is usually pretty low. Fires are still not likely to become serious and are often easy to control. When the fire danger is “high” (Level III), fires can start easily from most causes and small fuels (such as grasses and needles) will ignite readily. Unattended campfires and brush fires are likely to escape. Fires can become serious and difficult to control unless they are put out while they are still small. When the fire danger is “very high” (Level IV) or higher, fires will start easily from most causes. The fires will spread rapidly and have a quick increase in intensity, right after ignition. These fires can be difficult to control and will often become much larger and longer-lasting fires. During Level IV or higher fire restrictions wood and charcoal fires are prohibited in all areas of Los Padres National Forest including designated Campfire Use sites; however, the use of portable stoves and lanterns using gas, jellied petroleum or pressurized liquid fuel is allowed within designated Campfire Use Sites. A list of Campfire Use sites is available at. (http://www.fs.usda.gov/lpnf). You must clear all flammable material for a distance of five feet in all directions from your camp stove, have a shovel available, and ensure that a responsible person attends the stove at all times when it is in use. When the fire danger is “extreme” (Level V), fires of all types start quickly and burn intensely. All fires are potentially serious and can spread very quickly with intense burning. These fires are very difficult to fight and may become very dangerous and often last for several days. 1. Discharging of a firearm within 150 yards of dwelling or other building, campground, recreation site or other occupied area. 2. Discharging of a firearm on or across a National Forest System Road or a body of water adjacent thereto, or in any manner or place whereby any person or property is exposed to injury or damage as a result of such discharge. 3. Recreational target shooting is prohibited in all areas of the National Forest during fire season unless specifically authorized by a special use permit with the Forest; however, hunting with a valid State of California hunting license during open hunting season is exempt from this restriction. Most shooters are unaware of the many locations of OHV trails and often shoot into canyons with trails running along the ridge or behind a trail. The dry conditions also raise the fire restrictions quickly in the area and mandate closures to target shooting early in the year. The availability of Law Enforcement can be difficult over large geographically separated areas. Law enforcement serves a critical function by enforcing laws that apply to public use of federal lands as well as providing first responder emergency services to Forest visitors. Forest law enforcement officers (LEOs) and Forest protection officers (FPOs) serve in complementary roles. Both LEOs and FPOs enforce off-highway vehicle regulations and may issue citations for operation of motor vehicles in prohibited areas, for causing damage to natural and cultural resources, or for violations of fire and shooting restrictions. The California Air Resources Board has removed the requirement for separate periods for green and red stickers in the Pozo La Panza area; however, off-highway vehicle “green sticker” registration is still required. A USDA approved spark arrestor is required at all times. The California Motor Vehicle Code (CVC) includes a legal limit on sound produced by off-highway vehicles. Vehicles manufactured prior to Jan. 1986 have a noise limit of 101 dbA; those manufactured on or after Jan. 1986 have a noise limit of 96 dbA. Spark arrestor, registration checks, and sound checks must be performed by qualified personnel, such as Forest Protection Officers (FPOs). California law Allows officer to cite the parent or guardian of a child less than 14 years of age for allowing the child to operate an ATV without proper supervision or if the child is unable to reach the controls necessary to operate the vehicle safely. ATV riders under age 18 must have an ATV safety certificate or be supervised by a parent, guardian, or authorized adult with an approved safety certificate. FPOs that is qualified to write citations and make public contacts with those who are not following regulations. A lack of FPOs and an absence of law enforcement allows for illegal activities. The OHV area falls within the Adventure Pass Program, under the Recreation Enhancement Act (REA), which requires a daily or annual pass to park or camp. Funds collected from the program support patrols and maintenance activities. The Pozo La Panza area is considered a Special Permit Area (SPA) which requires users to pay a nominal fee for events that range from those that require a higher level of management support to simply spending the day riding on the trails. When users do not have an Adventure Pass, a Notice of Required Fee is given to the user and an incident report is written. Most personnel working in the area are not qualified to issue a Notice of Required Fee and can only encourage users to make sure they come prepared next time with an Adventure Pass. The closest location where passes are sold is in Santa Margarita south on Highway 58. The list of environmental regulations that apply to National Forests is very lengthy and complex and will not be reviewed in detail in this plan. References that describe how USFS National Environmental Policy Act (NEPA) regulations apply to the area are available upon request. An excellent primer is the Citizens Guide to NEPA published by the Council on Environmental Quality. The main objective of the NEPA is to protect the habitat of threatened, endangered and sensitive species such as the peregrine falcon, the California condor, the Western pond turtle, red legged frog, and sensitive plants such as the Santa Margarita manzanita, the Camatta Canyon amole, and Palmer’s mariposa lily. Studies must be done by qualified specialists to ensure that viable populations of plants and animals are not adversely affected by ground disturbing activities on the Forest.. Environmental studies must also be conducted to evaluate potential impacts to water quality, air quality, visual impacts, cultural sites and effects on adjacent land owners. A proper timeline will be developed for all projects to allow for the completion of required environmental studies followed by the required posting of public notice, public comment periods, announcement of a decision, and resolution of protests prior to conducting ground disturbing activities. As mentioned in the previous section, the National Environmental Policy Act (NEPA) process is required for all federal projects. Routine maintenance (level 1 and 2) usually falls into the lowest required NEPA category, a Categorical Exclusion. New construction and re-routes fall into level 3 maintenance and require higher levels of NEPA actions such as an Environmental Assessment (EA) or an Environmental Impact Statement (EIS). The Los Padres National Forest will follow the Forest Land and Resource Management Plan to guide future projects. The California State Parks Grants and Cooperative Agreements Program offers grants from funds collected through OHV registration (green stickers). Grants support the planning, acquisition, development, maintenance, administration, operation, law enforcement, restoration, and conservation of trails, trailheads, areas, and other facilities associated with the use of OHVs and programs involving OHV safety or education. To be eligible for grant funding applicants must maintain a wildlife habitat management program, an environmental monitoring program with annual reporting requirements and must adhere to soil conservation standards. Requests for grants are submitted through the states On Line Grant Application (OLGA) system at http://ohv.parks.ca.gov . The Recreation Enhancement Act (REA) program offers internal grant applications for forest that have projects within the Adventure Pass areas related to ecological restoration. The forest has been successful in the past at acquiring funding to perform trail work in Pozo / La Panza where erosion issues needed to be resolved. Forest Service staff will provide guidance to implement the management strategy of this plan. Staff should have a presence in the forest to ensure the plan is being followed through. Personnel accomplish annual reporting of trail conditions, monitoring of sensitive areas and training on government owned equipment. Partnerships with user groups will promote the feeling of ownership for those who work and ride the trail system. Outreach to new riders, recruitment of veteran riders and reunion of past riders will help grow organizations and improve the knowledge base. Environmental consciousness does not mean a roadblock to progress but a calculated, unbiased view of what is best for the forest. The NEPA process is the way of documenting that all steps have been completed. Education in the process can benefit all concerned parties and shared knowledge and workload can make the system easier for all. The following is a list of the trails with difficulty grading, use designation, and a brief description of the trail location and use. POWERLINE Easy- for all trail vehicle types 2 Miles Starting at the Turkey Flat Staging Area, this trail follows a sandy river bed and La Canada for the first mile. The last section climbs gradually up to an intersection with the Howard’s Bypass, a motorcycle trail. HOWARD’S BYPASS Most Difficult- for motorcycles 3 Miles This trail connects with the Powerline route and Black Mountain Road. This trail is designed for motorcycles only. It is narrow and steep and should be ridden by intermediate to advanced riders. The trail dead-ends at the Black Mountain Road for all riders, with the exception of street legal motorcycles. All OHV licensed motorcycles are prohibited on Black Mountain Road. LA CANADA Easy- for all trail vehicle types 0.7 Miles This creek bottom trail is a pleasurable ride located in a small canyon and is relatively flat. It connects Turkey Flat and Powerline trail to Turkey Flat II and Tower trail. TOWER More Difficult to Most Difficult- for trail vehicles 50”or less in width 2 Miles This trail begins at the Turkey Flat II Staging Area, parallels Navajo Road and intersects with the Las Chiches trail. The trail is suited for intermediate to advanced riders and provides the rider with some challenging sections. Riders must use this trail, since OHV green sticker licensed vehicles are prohibited on this section of Navajo Road. LAS CHICHES More Difficult to Most Difficult- one section for motorcycles only and most of the trail for all trail vehicle types 6.0 Miles From the intersection of Five Points, the first section is open to all trail vehicle types, which has several steep sections that are best suited for intermediate to advanced riders. This route follows ridge tops and provides the rider with some outstanding vistas of the valleys below. The last mile which connects to Fernandez Road is open for motorcycle only and ties in with the Burnout trail. LAS CHICHES CUTOFF Easy to More difficult – for all trail vehicle types 0.5 Miles This is a connector trail from Pozo Summit Road at the intersection with Pine Mountain route where the trail begins at an easy level to more difficult. It connects to the Las Chiches trail. PINE MOUNTAIN More Difficult to Most Difficult- for all trail vehicle types 7 Miles This trail is open to all OHV riders, but is best suited for the intermediate and advanced skill levels. The trail borders the Machesna Wilderness and contains one black diamond section called the Stair Steps. The route offers some outstanding vistas of the valley below and distant Machesna Mountain Wilderness. QUEEN BEE More Difficult- for trail vehicles 50”or less in width 1.5 Miles This trail begins and ends at Queen Bee Road and is best suited for intermediate riders. BURNOUT More Difficult to Most Difficult- for motorcycles 10 Miles This lengthy trail offers a wide variety of trail experience for the intermediate and advanced rider. It traverses over ridge tops with nice vistas as well as oak and grass covered valleys. It also connects with Mare Springs motorcycle trail, La Panza Bypass, Red Hill Road, and Fernandez Road. Navajo Flat Staging Area can be accessed across this trail where restrooms and picnic tables are available. Only street legal vehicles are allowed on Red Hill, Fernandez and Navajo Roads. LA PANZA BYPASS More Difficult- for trail vehicles 50”or less in width 1.5 Miles This trail is an easy ride for intermediate and advanced riders and goes from La Panza Summit to the Burnout trail. BENCHMARK Easy- for all trail vehicle types 1 Mile This trail is a level easy-going route. It dead-ends for 4x4s where it intersects with the Mare Springs and Burnout trails. QUAIL Easy- for all trail vehicle types 1 Miles Quail Road can only be accessed from Fernandez Road. Only street legal vehicles can access this route. This short route begins off Fernandez Road and dead-ends at a power line tower. NAVAJO BYPASS More Difficult- for motorcycles 1.5 Miles Navajo Bypass starts at Friis Road and ends at Navajo Road. This trail is best suited for intermediate riders due to two steep brick sections in the middle of the trail. Since this trail ends on Navajo Road, the section of the road that connects to the McGinnis Creek trail is legal for all motorcycles and ATVs. The remainder of the Navajo Road is for street legal vehicles only. McGINNIS CREEK Easy- for trail vehicles 50”or less in width 1.2 Mile This trail runs parallel to the creek and is level making it ideal for beginners. This trail can be accessed through Navajo Flat Staging Area where picnic tables and restrooms are available. Since this trail ends on Navajo Road, the section of the road that connects to Navajo Bypass trail is legal for all motorcycles and ATVs. The remainder of the Navajo Road is for street legal vehicles only. GARCIA RIDGE More Difficult to Most Difficult- for all trail vehicle types 4 Miles This ridge top route starts at Hi Mountain Road and dead ends at the Garcia Wilderness boundary. This intermediate route is open to all OHV riders. MARE SPRINGS Most Difficult- for motorcycles 3.5 Miles This is an excellent trail for the intermediate to advanced rider. The trail connects to the Burnout trail on both ends and provides for a challenging and scenic ride. HI MOUNTAIN LOOKOUT Easy- for all trail vehicle types This route starts at Hi Mountain Road and ends at the Santa Lucia Wilderness. Just a mile up the Road is Hi Mountain Campground. Continuing up the route bring you to a vista with access to Hi Mountain Lookout. The route continues across the ridge past hiking trail heads for Little Falls and Rinconada then down to Big Falls. This area is on Navajo Road, a quarter of a mile off Parkhill Road. There is a bathroom and several picnic tables in a flat area under large oak trees for shade. Powerline and La Canada trails leave from the northwest edge of the area and split beyond the wide sandy stretch of trail. There is a small warm-up/kids track that can be entered from just beyond the bathroom. This area is where Navajo Road, La Canada and Tower trail meet. This area has several dispersed camping sites and has been the site of trespassing and target shooting in the past and needs restoration to prevent further resource damage. This staging area is in an open field at the intersection of Fernandez and Navajo Roads. There are bathrooms and picnic table under several large oak and sycamore trees. McGinnis Creek enters from the west and Burnout is just across the road to the east. This area is under contract to become a stage area and campground with shade structures, fire rings and a kid’s track. Located at the end of Friis Road, the campground had picnic tables and fire rings shaded by oak trees. This quiet spot at the end of the road overlooks a meadow and provides access to the Fernandez trail for hikers and horses. This large campground is on the Pozo/ La Panza road near the eastern edge of the OHV area. With 15 camp sites and 3 bathrooms, this campground can accommodate larger groups that want access to the forest. Located 4 miles south of the Pozo Station then 1 mile up Hi Mountain Lookout is a paved loop and campsites under large oak trees. A bathroom in centered in the campground. Picnic tables and fire rings are available in sites. The Trail Management Objective (TMO) for each trail has the design parameters that have been approved by the District Ranger. The TMO assigns the designated use, location, trail width, and frequency of maintenance. The TMO is the basis for all work that will be done on a trail. A Habitat Management Program (HMP) is required for applicants to maintain eligibility for the California State Parks OHV grant system. All grant projects involving ground disturbing activities are subject to HMP requirements. If recreation activities pose no risk factors to special-status species and/or sensitive habitats completion of minimal documentation, HMP Part 1, is required. If the risks to special-status species and/or sensitive habitats posed by recreation activities cannot be determined, more complete documentation, including HMP Parts 1 and 2, must be submitted. HMP Part 2 has several sections. The first is a Summary of Changes that describes any changes made from the last HMP submitted. Section 2 is a table of all species that fall into 17 Special Status Species categories with their habitat and the time they were last seen in the area. HMP Section 3 is composed of maps of the project area with the locations of all species identified that could be affected. Section 4 is the management /monitoring program requirement for each species. Section 5 is documentation of the past years monitoring including biological assessments and stream crossing surveys to monitor erosion and habitat where water crosses trails. The on-going activity addressed in this BA includes both the use and maintenance of designated OHV routes within the LPNF OHV Program. Unauthorized OHV use outside of the designated trail system is not included because it is not part of the OHV Program. However, unauthorized use (“trespass” or off-trail travel) is recognized as an associated impact and discussed. Some OHV routes are jointly part of the Forest Roads Program, and the maintenance of these routes is performed by the Forest Service Roads Department. These routes are not included in this BA because they are covered under the Programmatic Biological Assessment for Federally Listed Wildlife Species That May Be Affected by the Transportation Facilities Maintenance and Use Program (2012 – 2022) on the Los Padres National Forest (in preparation). The Santa Lucia Ranger District (SLRD) has 102 miles of designated roads and trails within the program, which fall within four areas: Pozo/La Panza, Rockfront, Buckhorn Ridge, and Catway. There are two staging areas within the Pozo/La Panza OHV area that have campsites, restrooms and picnic tables. The 2009 National Visitor Use Monitoring survey determined that approximately 106,000 visitors use the OHV system on the forest each year. This total includes specific areas of heavy use such as the Pozo/La Panza area, which receives 25 to 35 OHV users per day on weekends. In addition to dispersed OHV use, private OHV groups are permitted to use the designated OHV areas to host special events. In the Pozo/La Panza area, at least four motorized and one non-motorized trail races and poker runs are held each year. These events draw between 100 to 350 participants, plus support staff, 100+ spectators, families and Forest Service law enforcement personnel. Nearby designated campgrounds, undesignated camping areas, and staging areas receive a substantially higher rate of use for multiple days during each event. Portable toilets are brought in for most of the events. Follow-up work is conducted by the groups after the events, and includes trail repairs, site cleanup, and trash removal. Specifications for maintenance activities conducted within the Forest Service Trail System are described in USDA Forest Service (1996) Standard Specifications for Construction and Maintenance of Trails, EM-7720-103. Maintenance conducted on OHV routes is similar to work conducted on hiking trails with some differences, such as a higher incidence of using mechanized trail equipment and the installation of short sections of concrete pavers as erosion control material. OHV route maintenance is categorized into three separate levels based upon the extent of ground and vegetation disturbance. Levels 1 and 2 are considered routine maintenance, and consist of activities within the existing trail way and clearing limit, which do not expand the route outside its current location. Level 3 maintenance is defined as reconstructing the trail way (as described in Section 915, EM-7720-103), and includes working outside the trail way in previously undisturbed areas. Level 3 work may include a partial trail re-route, or when excavation of fill (borrow) material is needed from outside the trail way in order to fill ruts or washouts within the trail way. Levels 1 and 2 OHV route maintenance are conducted on an on-going basis are included within this programmatic BA. Separate BA/BEs is prepared by the LPNF for each Level 3 maintenance project; therefore, Level 3 maintenance activities are not included within this programmatic BA. • The trail way is defined in Section 902 of EM-7720-103 as “the portion of the trail within the limits of the excavation and embankment”. • The trail tread is defined in Section 902 of EM-7720-103 as “the surface portion of the trail upon which traffic moves”. • Clearing limits for trimming vegetation are defined in Section 911.02 of EM-7720-103, and include provisions for vertical clearance, upslope and down slope limits based upon the steepness of slope, and are generally areas within 1 foot of the fill and back-slope catch points. • Clearing debris from water bars. These activities are conducted within the established trail way and clearing limits as defined in the trail guide. Work consists of clearing, grubbing, trimming, removing, and treating trees, logs, limbs, branches, and other vegetation within the clearing limits. Work can be performed along all sections of trails as long as the work does not result in any new ground disturbance outside the established trail way. Slough, berm and slide material removed from the trail way can be used as fill for gully and rill repair within the trail bed. This is considered Tread Maintenance, and is defined as “the re-establishment of the trail way within previously established routes” (Earthwork, Section 910, 911 and 912 of EM-77-103). Routine maintenance of OHV staging areas and trailheads is also included. Ground-disturbing activities are limited to the existing trail way. Work is performed by hand crews or mechanized equipment. Hand crews are used when possible in areas adjacent to known cultural or TEPCS species resources that may be impacted. Use of mechanized equipment is also limited to the time period having adequate soil moisture, which is needed to provide proper compaction of soils after blading and to minimize dust. All equipment operators are certified as trail operators in accordance with Forest Service policy. • Maintenance performed on OHV staging areas and trailheads, including grading of entry roads and parking areas, fence and barrier repair, and sign replacement. Design Parameters are technical guidelines for the survey, design, construction, maintenance, and assessment of National Forest System trails, based on their Designed Use and Trail Class and consistent with their management intent1. Local deviations from any Design Parameter may be established based on trail-specific conditions, topography, or other factors, provided that the deviations are consistent with the general intent of the applicable Trail Class. 1 For definitions of Design Parameter attributes (e.g., Design Tread Width and Short Pitch Maximum), see FSH 2309.18, section 05. 2 The determination of the trail-specific Design Grades, Design Surface, and other Design Parameters should be based upon soils, hydrological conditions, use levels, erosion potential, and other factors contributing to surface stability and overall trail sustainability. 1. NFS trails that allow motorcycle use must be designated for that vehicle class pursuant to 36 CFR 212.51 and displayed on a motor vehicle use map (FSM 7703.1). 2. For NFS trails that have been designated for motorcycle use and that have a Designed Use of Motorcycle, apply the Motorcycle Design Parameters and the following guidance. a. A variety of distances and recreation experiences may be provided by designing cutoffs for less experienced riders within a system of loop trails. An experienced rider can ride approximately 50 miles in an average day. Some riders can cover over 100 miles in a day. b. Trail alignment should exhibit decreasing randomness between Trail Class 2 and Trail Class 4.
c. Favor drainage dips over water bars. d. On trails in Trail Class 4, the alignment is generally moderate, with no sharp curves combined with steep grades. Novice riders may be subjected to sharp curves, but generally not in combination with rough surfaces or steep grades (see sec. 23.21, ex. 01). e. Favor climbing turns over switchbacks, within the applicable Design Parameter grade tolerances, as deemed appropriate, considering the use and direction of travel. Modify the level of challenge of a curve by increasing or decreasing its turning radius. 6 percent. On trails designed for novice and intermediate riders, consider providing a 4-to-6-foot barrier on the downhill side of a switchback. g. The speed of a motorcycle entering a turn varies depending on the radius of the turn. A trail designer can slow the speed of a motorcycle entering a turn by decreasing its turning radius. A trail designer may increase the length of a trail in a limited area by increasing the number of turns. h. Hardening of switchbacks and climbing turns in sensitive soils is recommended. Suggested hardening materials include concrete blocks, soil, and cement. I. For minimum bridge widths and railing heights, refer to FSH 7709.56b, section 7.69, exhibit 01, Trail Bridge Design Criteria. Bridges should have a straight approach and should not change directions. Special decking may be necessary to accommodate wheeled vehicles. j. To minimize confusion, consider locating trail junctions so that no more than two trails intersect at one point. 2 The determination of the trail-specific Design Grade, Design Surface, and other Design Parameters should be based upon soils, hydrological conditions, use levels, erosion potential, and other factors contributing to surface stability and overall sustainability of the trail. 36 CFR 212.51 and displayed on a motor vehicle use map (FSM 7703.1). 2. For NFS trails designated for ATV use and that have a Designed Use of ATV, apply the ATV Design Parameters and the following guidance. a. A variety of distances and recreation experiences may be provided by designing cutoffs for less experienced riders within a system of loop trails. c. Include frequent elevation changes and turns appropriate for each skill level. These design features can be incorporated as appropriate to slow vehicle speeds, increase safety, and provide more riding time per mile (see sec. 23.22, ex. 01). d. Favor drainage dips over water bars. f. On trails in Trail Class 4, the alignment generally should be moderate, with no sharp curves combined with steep grades. Novice riders may be subjected to sharp curves, but generally not in combination with rough surfaces or steep grades. If possible, incorporate climbing turns with a wide radius for ascending hills. Use switchbacks on steep slopes only for more challenging trails. g. Hardening of switchbacks and climbing turns in areas with sensitive soils is recommended. Suggested hardening materials include concrete blocks, soil, and cement. h. For minimum bridge widths and railing heights, refer to FSH 7709.56b, section 7.69, exhibit 01, Trail Bridge Design Criteria. Bridges should have a straight approach and should not change directions. Special decking may be necessary to accommodate wheeled vehicles. I. To minimize confusion, consider locating trail junctions so that no more than two trails intersect at one point. 1. NFS trails that allow four-wheel drive vehicle use must be designated for that vehicle class pursuant to 36 CFR 212.51 and displayed on a motor vehicle use map (FSM 7703.1). 2. For NFS trails designated for four-wheel drive vehicles over 50 inches in width and that have a Designed Use for that type of vehicle, apply the appropriate Design Parameters and the guidance below, as applicable. a. The level of challenge provided by a trail increases with the size of the vehicle. For example, a trail that is challenging for a vehicle with a short wheelbase (less than 100 inches) is likely to be even more challenging for a vehicle with a long wheelbase (greater than 100 inches). b. Trails designed for four-wheel drive vehicles greater than 50 inches in width have varying degrees of horizontal and vertical alignments, with safe tread for an average speed of 2 to 4 miles per hour. c. A variety of distances and recreation experiences may be provided for less experienced riders by designing cutoffs within a system of loop trails. f. Alignment on trails with grades of 4 percent or less should provide 5 lock-to-lock turns (five changes of direction of the steering wheel, from far right to far left) in the first 150 feet of the trail to restrict use of the trail to smaller vehicles. The rest of the trail should have 2 to 5 lock-to-lock turns, depending on vegetation, topography, and planned challenge level (see sec. 23.23, ex. 01). g. Trails with grades of 4 to 10 percent should have wider turning radii and dips and bumps, as topography allows. Depending on topography, locate 10 percent or more of the trail on a relatively straight alignment, with a maximum side slope of 30 percent. Wet weather gates are closed in order to protect Level 2 roads and trails from rut damage and resource damage or destruction in the Los Padres National Forest. The overall program manager for the District gate closure plan is Tom Plymale. The Duty Officer will take responsibility for the implementation of the plan as needed and coordinate with Recreation when doing so. Each area has a Fire Prevention Technician and a Recreation Technician assigned to it – these are the Patrollers that are assigned leadership roles for closing and opening the gates. They will be communicating with local area resources to coordinate these efforts. If one of the Patrols are not here or have other commitments, they are responsible to make sure someone else can cover for them to insure the closure take place following the proper procedure. The local Fire Stations and District Employees are expected to help when asked and available. 1. The duty officers and Patrollers will work together to keep each other aware of storm conditions, the amount of rain predicted, the amount of rain that has fallen, local road conditions, and know who is going to do what to get the roads closed. 2. Patrollers keep the front desk and the Duty Officer informed of conditions requiring closing and prior to re-opening the gates. 3. Patrollers communicate schedules in order to ensure coverage for their closure areas. 1. Inconsistent application of closures by staff. Have a yearly meeting before November to coordinate! 2. Public notifications. Issue a press release at the beginning of the season explaining the forest policy on wet weather closures. Do a separate press release when threatened and endangered species gates are closed. Channel 22 can help with community service announcements. 4. Accidentally locking a visitor behind a closed gate-check for people first. 5. Getting stuck or hurt – be informed of the weather and let dispatch know where you are. 6. Missing or unusable locks – carry extra locks, chains and lubricant. Pre-rainy season, Patrollers need to complete a gate inventory (form is attached) to make sure the gates are properly signed and have correct locks and chains. 7. Wrong key – carry all keys needed for wet weather gates on the District. 8. Drive area roads on ATV. Personnel must be certified before operating ATV. Set up ATV training with qualified instructor on Forest or at State OHV area. Follow all safety procedures when operating ATVs. 9. Gate signs missing. Gates should be signed per Regional standard (see attached diagram). Notify the District Engineer of missing signs. 10. Employees or private landowners drive closed roads. When roads are closed to prevent road damage, they are closed to everyone. If a private landowner wants to drive on a closed road, they need to take on making the road an all-season road and the subsequent maintenance. This needs to be done by permit prior to the wet season. 1. In general, after 2 inches of rain, roads are closed before large storms. An exception to this is when an earlier storm is predicted to be major, dropping 2+ inches of rain, or if long dry spells occur between storms, etc. Soil conditions & predicted rain should drive closure needs. 2. Lock the gate behind you when going to check for visitors. Note the cars that need to leave. After your sweep, wait at the gate until everyone has left. 3. If someone refuses to leave, explain they will be locked in for days until the road dries, and that they are responsible for any resource damage if they drive around. Call Law Enforcement, if they still refuse to leave. 4. Change the area closed signs on the main road or highway when the gates are closed. 5. Inform the Front Desk of closed roads, or upcoming closures, as soon as possible. 6. Front Desk needs to notify the SO of closures. 1. Coordinate with District Engineer about road conditions. 2. Typically wait 2-3 days after storm and check road for dryness. Drive the 2-WD roads to check for obstacles (fallen trees/rocks, washouts, slides). 3. Remove obstacles you can remove. Notify your supervisor/District Engineer of obstacles that can’t be moved and arrange for removal (ex: get a qualified feller to cut out trees). 4. Lock the gates in the open position. Open gates if the road can be traveled safely. If there is a slide and people can turn around safely, leave the gate open; if not – the road should remain closed and arrange for fixing. 5. Change the area closed signs on the main road or highway when the gates are opened. 6. Inform the Front Desk of road status of opened gates as soon as possible. 7. The Front Desk needs to notify the SO of road status. 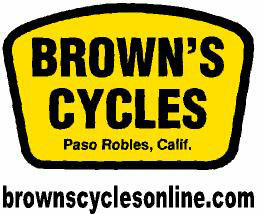 • Pozo-Arroyo Grande Road closures will be coordinated with the SLO County Roads Department. The County will maintain and close the gates at the north (Pozo Station) and south end of the Pozo-Arroyo Grande Road. The FS will help the county by contacting them when we need the road closed to protect the road from resource damage and by sweeping the road and helping with any closure. Contact with SLO County is Tim Kate (805) 801-4738. An email message sent to one of them would be good to document coordination. The FS needs to get our lock added or a key to each gate if it is possible. • 3- Gates located at Pozo Station. Three gates are at this location: two large gates and one walk-through. All gates must be locked during wet weather closures. The County is in charge of closing these gates. • 1- Gate on the Arroyo-Grande side where the paved road ends. The County is in charge of closing this gate. • On the Pozo side, a flip sign is located in Santa Margarita informing public that the Pozo-Arroyo Grande road is closed (FS road 30S05). • On the Arroyo Grande side, two signs are in place to inform visitors of gate closures. One sign is located at the turn-off at Lopez Lake, and one sign approximately eight miles from the turn-off to Ranchita Estates where the paved road meets the gravel. • 2- There is a gate located eight miles from Pozo Station where San Luis Obispo County and Forest Service boundaries meet. Two gates are at this location: one large gate and one walk- through. If the County closure works, these gates will not need to be closed. • Garcia Ridge 4WD road gate is rarely closed. • 1- Gate is located on Hi Mountain Ridge Road that should be closed after Hi Mountain Ridge and Hi Mountain Campground is swept. La Brea/Colson – 5 gates – wet weather and T&E species. • Install a flip sign at the entrance to Colson Canyon informing the public of a gate closure 4.5 miles ahead. • 1- At the Forest Boundary (if you can, notify Paul Antolini at 925-4464). • 2- On the top of Rattlesnake & Colson Canyon (FS road 11N04) there is a new pipe gate and a Powder River gate. Both gates should be closed. • Close the gate at Sierra Madre Road and Highway 166. • 1- Gate located below Miranda Pines Campground, approximately five miles off the pavement on Sierra Madre Ridge road, FS Road 11N03. • 1- Threatened and endangered species gate located two miles from Wagon Flat Campground. This gate is closed only upon the advice of the wildlife biologist if it is needed during the red-legged frog-breeding season, approximately February through April. • 1- Gate located approximately ½ mile off Highway 166 on FS Road 30S02. • 1- Gate on Shaw Ridge that is closed during red-legged frog-breeding season, approximately February through April. Make sure a sign is posted on the gate explaining this. • A sign is located five miles off Highway 101 on Highway 166 next to the Bull Canyon turn-off that must be updated when gate is opened and closed. • 3- Three gates located at Five-Points. Gate closures for Friis Road (FS road 15E04), Navajo Road (FS road 29S02), and Las Chiches OHV Trail 29S16. • 1- Large gate and motorcycle gate at the bottom of Navajo Road 29S02. • 2- Gates located at the entrance to Queen Bee Trail at Queen Bee Road (FS road 30S18) and exit at Pozo Summit. • 2- Powder River gate for Powerline OHV trail located at Turkey Flats trail (FS trail 29S27) and one gate on Black Mountain road. • 2- Gates located at Pozo Summit Road (29S01). One on Pine Mtn Trail (30S17) and one on Las Chiches Cutoff OHV Trail, 16E05A. • Pine Mtn Trail (30S17) at Pozo Summit. **When closed/opened, change the Pozo OHV Area sign at Santa Margarita & Red Hill Road to match. Close the north gate on the Zaca Ridge Road & leave closed for the wet season. 2. Figueroa paved roads – 4 gates. • 1- Happy Canyon – do not close unless there is a resource damage concern (such as a slide). Coordinate with SBRD. • 1- Sunset Valley – normally, do not close unless there is a damage concern (such as a slide, flood or people start ripping up the areas off road to play in the mud). • 2- Figueroa – do not close unless we are expecting snow, and then close the Ranger Peak area (two gates) to prevent motorist- pedestrian conflicts. Coordinate with SBRD. • “Icy Road” signs need to be flipped before winter icy conditions begin and then closed once icy conditions are over for the season. • Gate located where pavement turns to dirt, pass the 2nd tower. Keep it closed all year round. • Gate located near the 1st tower is not normally closed. The road is all-season up to the 2nd towers. • 1 – Gate located past Bates Canyon Campground, approximately six miles from Highway 166. The turn-off is at Cottonwood Canyon, FS Road 11N01. • 1- Gate located four miles up dirt road at intersection of Sierra Madre Ridge Road, FS 32S13. This gate is rarely closed & can remain open if the gate at the beginning of Sierra Madre Rd & Hwy 166 is closed. www. Why is another necessary? restricted to designated routes is more limited. resource sites are included for those who want to delve deeper into the OHV literature. and sustainability have not been included in order to keep the list short. and Wernex explain OHV trails from the rider’s perspective. Development Center, USDA-Forest Service, under contract with NorthStar Technology Corp.
(AG-9A72-K-11-0009, NST 8501-045). June 30, 2012. Parker, T.S., 2004. Natural Surface Trails by Design. Natureshape, LLC, Boulder, CO.
Highway Vehicle Conservation Council, Great Falls, MT. trails, the publication by Furniss provides a good explanation of hydrologic connectivity. concepts that can be applied to watercourse crossings on OHV trails. California Department of Parks and Recreation, Sacramento, CA, p. 317. OHV Trails in Wolf Pen Gap, Ouachita National Forest. p. 80. Barrow, J.D., Groenier, J.S., 2012. Plastic Bottomless Arch Culverts for Trails. and exposure to toxic chemicals. Stream Notes, Stream Systems Technology Center. USDA Forest Service, Rocky Mountain Research Station, Fort Collins, CO.
references provide the background needed for designing a sustainable trail system. Development Guidelines. St. Paul, MN. Training Reference Package. USDA-Forest Service, Washington, D. C., p. 81. Service, San Dimas Technology and Development Center, San Dimas, CA, p. 94. Vachowski, B., Maier, N., 1998. Off-Highway Vehicle Trail and Road Grading Equipment. Lockwood, Cam, 2010. Trails 2010: A Trail Construction and Maintenance Update. Service, Missoula Technology & Development Center. Service, Pacific SW Region, Vallejo, CA, p. 34. Service, Missoula Technology and Development Center, Missoula, MT, p. 166. Pacific SW Region, Vallejo, CA, p. 16.
practical field guide. Wildland Solutions, Clyde, CA. Center, Missoula, MT, p. 27. Service, Pacific SW Region, Vallejo, CA, p. 18.
by Ranger, or by collection of sediment in a silt fence trap as described in Robichaud. Parks, OHMVR Division, Sacramento, CA, p. 54. Hall, F.C., 2002. Photo Point Monitoring Handbook: Part B–Concepts and Analysis. Valley Authority; Department of Forestry, Southern Illinois University, p. 36. Department of Forestry, Sacramento, CA, p. 10. Mountain Research Station, Fort Collins, CO, p. 24. Highway Vehicle Conservation Council, Sheboygan, WI. Most of the research on the effects of OHV traffic is related to uncontrolled open riding. references to some of this literature for grant applications or for environmental analysis. Ouren is a recent and extensive annotated bibliography on the effects of OHV traffic. of non-motorized recreation on wildlands. extensive bibliographies, and internet resources. Open-file report 2007-1353. U.S.
Department of the Interior, U.S. Geological Survey, Reston, VA, p. 225. Resources, University of Vermont, Burlington, VT, p. 32. Natural Resources–A Summary of Knowledge. Modern Litho, Jefferson, Missouri, pp. on-line bookstores, and links to additional resources.